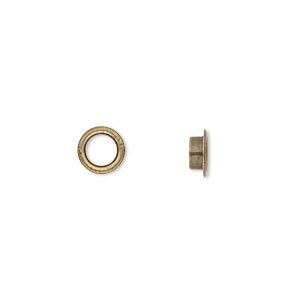 Grommet, glue-in, antique gold-plated brass, 7mm round, 4.5mm inside diameter. Sold per pkg of 100. Item Number: H20-A5319FN Have a question about this item? Brass grommets are ideal for finishing beads created with clays and Apoxie® Sculpt, or to add detail to Dione® faceted glass rondelles. 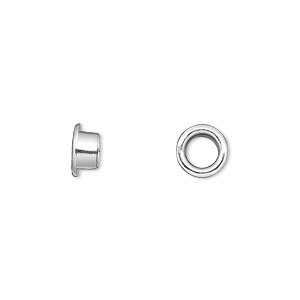 Grommets can also be used to reinforce holes in large-hole beads with a 5mm hole. Grommet, glue-in, gunmetal-plated brass, 7mm round, 4.5mm inside diameter. Sold per pkg of 100. 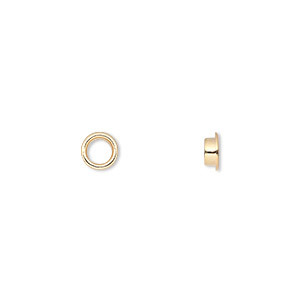 Grommet, glue-in, gold-plated brass, 5.5mm round, 3.5mm inside diameter. Sold per pkg of 100. 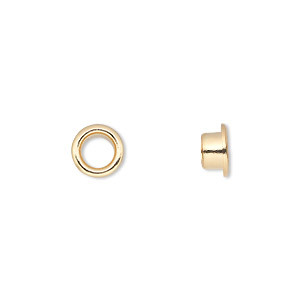 Grommet, glue-in, gold-plated brass, 8mm round, 5mm inside diameter. Sold per pkg of 100. Grommet, glue-in, copper-plated brass, 7mm round, 5mm inside diameter. Sold per pkg of 100. 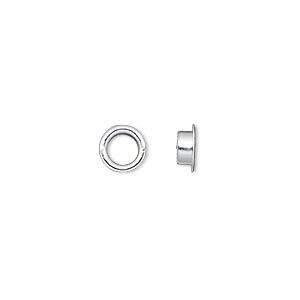 Grommet, glue-in, silver-plated brass, 5.5mm round, 3.5mm inside diameter. Sold per pkg of 100. Grommet, glue-in, silver-plated brass, 8mm round, 5mm inside diameter. Sold per pkg of 100. Grommet, glue-in, copper-plated brass, 5.5mm round, 3.5mm inside diameter. Sold per pkg of 100. Grommet, glue-in, gunmetal-plated brass, 5.5mm round, 3.5mm inside diameter. Sold per pkg of 100.